When I bought my first house in Florida, a railroad track ran more or less parallel to the back of my property. We were separated only by a small bit of undeveloped land. Beyond the track was the intercostal waterway so I enjoyed the relative privacy in an otherwise busy area. The railroad had been active for many years but shortly after we bought the house it was closed down like many others across the country. In some strange way I actually missed the sound of the train as it rumbled past our back yard to who knows where. The Florida Department of Transportation eventually bought the right of way from CSX and seven years later the County Commissioners approved the funding to create a bike trail on the 34 miles of abandoned rail road including the section that ran behind my house. In the years that followed, I watched as the trail grew, linking parks and people in small communities. It became a part of the landscape and part of my life style. I logged hundreds of hours riding my bike past the palmetto bushes and under the overhang of live oaks draped with Spanish moss. When my mother was diagnosed with cancer, I had long conversations with God as I walked along the trail at sunset on so many nights. The trail taught me that no matter how hard I tried, I was not cut out for in-line skates but it was the quickest bike route to a nearby ice cream shop. I have never been a runner and I find walking a little tedious but a ride on the trail gave me a chance to get a little exercise as well a quiet place to collect my thoughts. I eventually sold my first house and moved but I never lived far from any section of the trail and I enjoyed it for many years. It’s been a decade since I lived in that part of Florida but I am seeing a similar opportunity for a “rails to trails” project cropping up here in the Brevard area utilizing a 19 mile stretch of track that travels from Hendersonville to where the Ecusta paper plant used to stand near Pisgah National Forest. After years of service, the rail road was closed in 2002 and has since changed ownership. The group Friends of the Ecusta Trail (FOET) is hopeful that the new ownership will get on board with the plan of converting the unused rail to a bike friendly path for walkers, runners, and riders. Having a trail like this is a natural fit for Transylvania County. Our area has long been known for the quality of life and the bountiful options of outdoor activity. DuPont State Forest is known throughout the southeast as some of the best mountain biking around. The French Broad river is there for paddlers and hiking trails are everywhere. 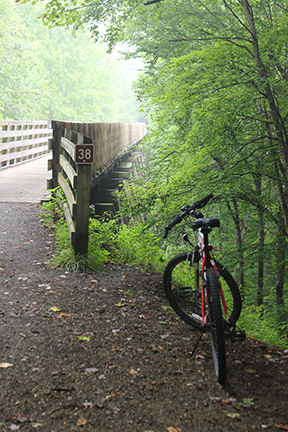 According to the winter newsletter for the North Carolina Rails-Trails organization, “some people say there’s no place on earth quite like Transylvania County for outdoor recreation, especially bicycling and hiking. And the French Broad River – meandering alongside and under the proposed Ecusta Trail – has 100 miles of dam-free paddling including designated put-ins and campsites every few miles along the entire route. ” I couldn’t agree more. This trail idea is a slam dunk for our community. As the newsletter explains, not everyone wants the heart pounding rush of mountain biking, especially some of us baby-boomers. We’re looking for a safe place to get some exercise outside and enjoy the incredible beauty that surrounds us. If anyone has any doubts about what a trail like this can do for an area we only have to look south of us to the Swamp Rabbit trail in Travelers Rest, South Carolina or north of us to the Creeper Trail in Abington, Virginia for two great examples. I haven’t ridden the Swamp Rabbit trail, but I can attest to the amazing beauty and accessibility of the Creeper Trail. I’ve ridden it twice now with a group of gal pals from the area and can’t wait till I can go again. I’m hopeful that the folks who make projects like this a reality will see things the way I do. If you want to get more information, or get involved start with Friends of Ecusta Trail visit their website EcustaTrail.org.